A good pair of gauntlets will do more than just keep your hands safe, even during the hectic chaos of battle. These Black Ice Gauntlets possess a distinctive fantasy style, as well as a level of protection that is difficult to beat. These impressive gauntlets are sold as a pair and are crafted from quality 18-gauge steel. 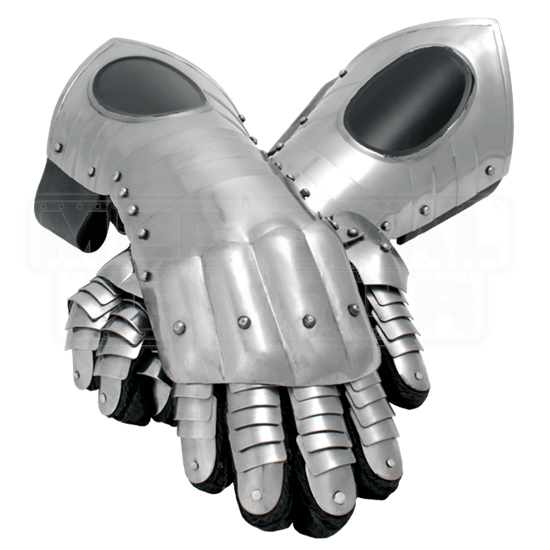 They possess a polished steel finish, as well as a single form of decoration, a small black oval set on the plating of each gauntlet. The gauntlets consist of metal plating that is wrapped around a soft, inner suede glove, which ensures that while impressive on the outside, they are also exceptionally comfortable (for armour). A cuff along the back secures the bracer to the forearm, while articulated plating protects the fingers without sacrificing movement. Pair these stunning Black Ice Gauntlets with their namesake armour and you will complete the look of a Rakh warrior from the ConQuest universe. Great product, Short delivery time and came all wrapped up and ready to go!